In Ecuador, you’ll not only be in the middle of the world, but you could be on top of it. That’s because thanks to its location on the equatorial “bulge,” the peak of the country’s 20,564-foot Mt. Chimborazo is the point on the Earth’s surface that’s the farthest from the Earth’s core and closest to the sun. There truly is something for everyone here. Mountains, beaches, rainforests, cities, and small towns…all with a price tag nearly anyone can afford. By the way, Ecuador’s currency is the U.S. dollar—no currency conversions necessary. Ecuador has only two seasons: dry, from June to September, and wet, from October to May. On the coast, daytime temperatures typically range in the mid 80s and only occasionally the mid-90s. But in the Sierras, daily temperatures hover near 75 F.
This near-perfect weather contributes to a low cost of living in Ecuador. If you don’t need heat or air conditioning for your home, your utility costs are negligible. Suzan’s budget doesn’t include health insurance, but that’s affordable in Ecuador, too. You can buy private insurance for typically one-half to one-fourth the cost you may be paying now in the U.S. for instance. Or you can opt to use Ecuador’s national social security health care system for an average cost of about $70 a month. 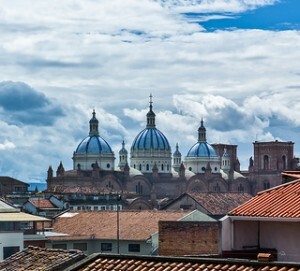 If you are over 65 and have a resident visa, you can take advantage of Ecuador’s retirement benefits program. You can get discounts on domestic airfares and internationals airfares that originate in and return to Ecuador. You’ll be eligible for a free landline telephone, 50% off public transportation, admission to sporting and cultural events, reducted utility bills, and more. If there are any challenges to living in Ecuador it’s that some of your favorite items are either unavailable or more expensive than at home—things like your favorite brand of peanut butter for instance. But weigh that against amazing geographic diversity, tremendous overall affordability, and the world’s most perfect climate, and it’s hard to complain about anything in Ecuador. Choosing where to live in Ecuador was no easy venture for my family. After ruling out large cities, which my husband doesn’t care for, and areas that were too warm for my northern blood, we settled on giving the small mountain village of Cotacachi a whirl. It wasn’t long before Cotacachi had completely captured our hearts. The quaint main street lined with leather boutiques and the tiled designs in the sidewalks were aesthetically pleasing. Seeing the Kichwa culture in action each day made us feel as though we were in the midst of an anthropology study. And the friendly helpfulness of the locals served to increase our enchantment with the town. The townspeople have great pride in their home and restoration projects and community improvement activities are constantly underway. The indigenous people also have fierce pride in their heritage and are happy to share it with others. Though Cotacachi is a small town, there is always plenty to keep me busy. On sunny days I’ve hiked around the sapphire waters of Lago Cuicocha and to several nearby waterfalls. For $15 I can take a horse out for an hour and a half. Nearly every weekend brings on some type of festival or parade. If I’m in the mood for an indoor activity I can head over to the Ami Theater where foreign films, live plays, and musical events are held. Or I can meet friends at the hip New York style coffee house where a decadent coffee frappe costs only $2.50. If you’re the type who enjoys a small-town feel and misty mountain views, you just might find yourself enraptured by Cotacachi. And you won’t need a hefty bank account to live here. A couple can live well on $2,000 a month or even less. Typical furnished two-bedroom apartments range from $450 to $600 a month, though you can find rentals for as low as $200. As properties for sale, you can still find new, well-built three-bedroom/two-bath homes with vaulted ceilings, a fireplace, and more for as low as $110,000. See here for more information. Fast forward to today and our life in Cuenca exceeds all expectations. The reasons we originally moved here haven’t changed: The low cost of living, great weather, outstanding health care, and our family in the States is still close. If you’re looking for a true expat experience and not a re-creation of the U.S. in a foreign country, I can’t think of a “softer landing” than my hometown. Cuenca is so manageable. A taxi ride from one end of town to the other rarely takes more than 15 minutes (or costs more than $2.50). The restaurant scene has exploded in the last year with new sleek, modern sushi and Asian outlets plus higher-end bistros. Yet you’ll rarely find an entrée for more than $12 to $15. A brand new mall just opened in Cuenca’s booming west side. Because of the increasing number of expats there are now so many more special-interest groups—book clubs, fly fishing, biking, card players, writers, religious, even trivia teams. If you don’t see your group in this list, feel free to start it when you arrive. Cuenca remains amazingly affordable. A couple renting an unfurnished three-bedroom condo can enjoy an extremely comfortable lifestyle for less than $1,700 a month. And you’ll find real estate prices extremely reasonable. A 950-square-foot loft-style condo in a renovated historical building can be had for just $105,000. Find details here. 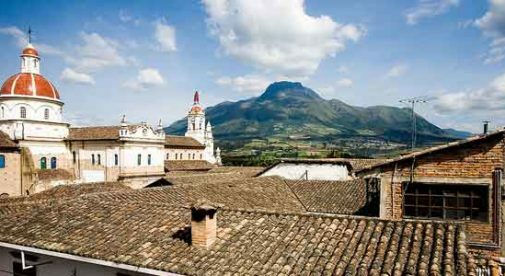 In the heart of the country you’ll find one of the world’s most beautiful cities. This is the “Middle of the World”…and sitting right on the equator is Quito. From great cuisine to shopping, from concerts and other cultural events to acres of parks and plazas, Quito has it all…the best hospitals and universities in the country and thoroughly modern neighborhoods where you can have your pick of local fare, upscale salons and high-end boutiques. I love poking around Quito’s Old Town, named the world’s first UNESCO World Heritage site back in 1978 for its well-preserved colonial architecture. Quito is perched at 2,850 meters (9,300 feet) above sea level. Although there is a rainy season from October to February, days are typically warm and sunny with highs in the low 70s. And at this elevation, there are few pesky insects to contend with. In Quito it’s easy to escape the hustle and bustle of the city for the slower pace of suburban life. The valleys that lie to the east of Quito are where many of the city’s middle- and upper-class commuters—as well as many foreign embassy and foreign corporate employees—choose to live. Tumbaco and the nearby town of Cumbayá offer convenient shopping, first-rate hospitals and excellent schools. The towns of Sangolquí and Conocoto have all the modern amenities you might expect, including the largest shopping mall in Ecuador. 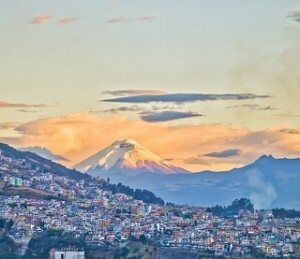 For cost of living, it’s tough to beat Quito and environs. It’s easy enough to rent a two-bedroom apartment in an upscale neighborhood for $600 to $1,000. A couple can enjoy a comfortable urban lifestyle for about $2,000 a month. And if you’re in the market to buy then $165,000 will get you a 2,800-square-foot four-bedroom/three-and-a-half bath apartment in north-central Quito. See here for details. Looking out the window from my condo overlooking the beach in Salinas, I can see a string of small fishing boats heading out across a blue-green ocean in search of sea bass and tuna. We are in the last few weeks of our winter, so it’s a pleasant 72 F, with a cool breeze coming through the open window. I can see people strolling along the malecon, the seaside walkway, stopping near the tall palm trees to pose and take pictures. A flock of chattering parrots dart past, followed by a stately line of pelicans. Life here can be as slow and relaxed as a walk on the beach, or you can amp it up a notch with your choice of many water sports, including spending time at one of the area’s two major yacht clubs. In the evening, you can spend time in a lively restaurant or nightclub or join in the growing number of expat activities. Salinas is the perfect size for us. It’s small enough for our vendors at the mercado to know and greet us, and we can easily walk to our favorite restaurants, but big enough to offer reliable Internet and easy access to good hospitals and clinics. The mega-supermarkets in the El Paseo Mall in nearby La Libertad provide just about anything else we might need. Located just two degrees south of the equator, our days in Salinas, as in all of Ecuador for that matter, are always almost exactly 12 hours long. The Humboldt Current offshore moderates our weather and we have just two seasons, with slow transitions between them. The cooler part of the year has overnight low temperatures no less than the mid-60’s, and days in the mid- to upper- 70s F. In the hottest part of our summer, temperatures rarely creep above 90 F, with nighttime lows in the mid-70s F. Because this is a very arid region we get about the same average rainfall as Las Vegas. Humid days are also very rare. Property taxes for a year here are less than most people pay per month in the States. Buses are 25 cents, and local taxis run a few dollars for anywhere in the area. At our mercado we buy fresh local produce, dairy products, meats and seafood at extremely low prices—a pound of large shrimp (12-14 in a pound) are usually $7. Large pineapples are $1.50, fresh strawberries are $1.50 a pound, oranges are 15-20 for $1, and bananas are practically free. As for real estate prices, beachfront property starts about $65,000 depending on size and location, with many two- or three-bedroom places available in the $125,000 to $200,000 range. As with most resort areas, prices drop as you move back from the beach. Rentals are available from $400 per month on up. To see a range of properties, check out this website. No grocery store. No gas station. Yet with 1,000 expats among the town’s 5,000 or so residents, Vilcabamba boasts the highest ratio of foreigners anywhere in Ecuador. The obvious appeal of this rural village near the Peruvian border starts with dropdead gorgeous scenery and near perfect weather. From atop many a misty mountain ridge, a patchwork quilt of blue-green forested valley stretches as far as you can see. Throw in super-fresh air, mineral-rich water, and a perfect climate that allows you to grow beautiful fruits and vegetables year-round in rich, volcanic soil and you’ll have an idea of why this area is so appealing. Many expats in Vilcabamba are here to pursue their passions, whether it’s art, music, writing, permaculture, or New Age topics. I have a friend who, in his eighties, uprooted himself from Hawaii where he’d lived for over 30 years and moved all the way to Vilcabamba because of his passion for finding the purest water possible. Life is very slow-paced in Vilcabamba. The streets can usually be regarded as extensions of the sidewalks. It’s typical to find locals and tourists alike ambling down these streets on horseback. Vilcabamba is a popular destination for young backpackers who come to hike mountain trails and soak in the laidback atmosphere. There are a surprising number of dining options, often with live music. If you’re looking for big-time organized cultural activities or cinemas, you’ll need to make the hour drive to Loja. The average expat resident lives in a modest home with enough land for cultivation. 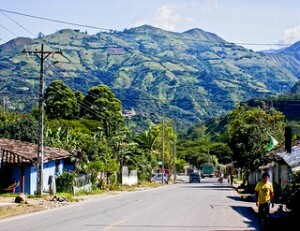 A vehicle is a necessity, and gas can be purchased in Malacatos, just a 10-minute drive north of Vilcabamba. You’ll find a wide range of real estate prices throughout Vilcabamba. Most couples owning their home would have a monthly budget of less than $1,500 per month. One place to start your real estate search is here. 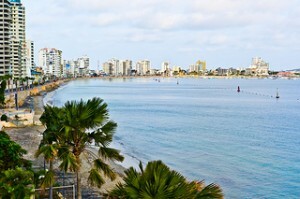 Costs: Ecuador offers some of the best value of any overseas retirement destination. In most parts of the country there’s no need to own a car. In smaller villages like Cotacachi and Vilcabamba, a taxi ride across town costs only one dollar. And without the need to heat or cool a house, the electric bill stays below $30 per month. A cozy furnished two-bedroom apartment of approximately 600 square feet on the edge of Cotacachi rents for about $450 per month with utilities included. A similar place in Quito with close proximity to parks, shopping centers, and quality dining options will go for $600 or more. You’ll find expat couples happily renting a home in the countryside and living on a modest total budget of as little as $1,000 per month. But for most people somewhere between $1,500 and $2,000 is more common. On top of your monthly fixed costs you should allow for a discretionary amount, say between $200 and $500 for things like visits back home or unplanned expenses. And bear in mind that you’ll have some startup costs when you first arrive. Weather: Despite your location on one of the earth’s closest points to the sun the temperature is perfectly comfortable with no need for an indoor fan. When you settle in to bed for the night a few thick blankets will keep you nice and cozy as the temperature drops. Throughout the highlands of Ecuador this is exactly what you’ll find with temperature highs reaching 75 F or so and lows dropping to an average of 49 F. There is rain year-round, but June through September tends to be a bit drier. If you’re in the market for a toastier climate, Ecuador’s Pacific Coast can give you the chance to swing in a hammock between shady palms while the sea breeze plays across your shoeless toes. Temperatures typically hit highs of 85 F and lows of around 70 F. The humidity will be higher here and average rainfall is 10 inches per year, though the majority of that comes in the winter months of January through March. With its four distinct geographical zones (including the Galapagos Islands) and abundance of microclimates, Ecuador has something to please nearly everyone. Community: By and large, all Ecuadorians are hospitable and have a deep respect for their fellow citizens of the world. Treat them with respect in return and you’ll be warmly welcomed into their communities. You’ll find many expats are involved in all sorts of charitable activities, from animal rescue and staffing a local soup kitchen to scholarship fundraising. In return, they’ve been invited into the smaller, remote communities where they’ve been able to experience firsthand the true heart and culture of Ecuador.